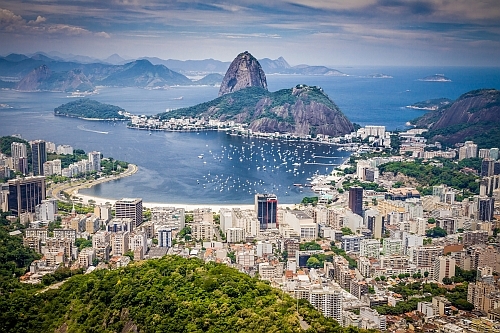 Delta and United Airlines have dropped the price of their flights from Vancouver to Rio de Janeiro, Brazil down to $808 CAD roundtrip including taxes. It pains me a bit to call this a great deal, considering there were flights to Brazil in the $600s to low $700s roundtrip back in 2015/2016. A lot of the flights have 2 stops each way. Delta's connections are through Seattle and Atlanta. United's are through Denver and Houston. 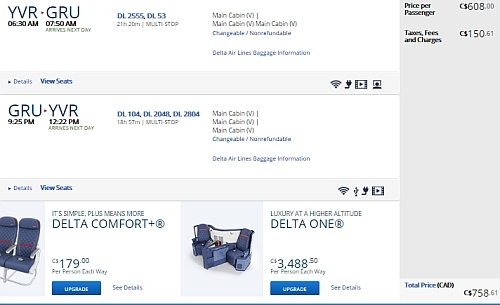 But there are also some dates with 1 stop each way, for $878 CAD roundtrip. United Airlines is also showing flights from Vancouver to Sao Paulo, Brazil for $878 CAD roundtrip. - Look for the dates that are $808 to $848 roundtrip. 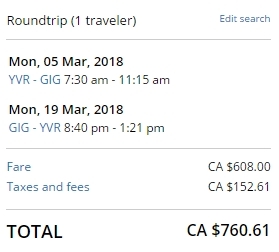 Update 2/9 - Delta has now dropped the price of a few flights from Vancouver to Sao Paulo, Brazil (GRU) down to $758 CAD roundtrip including taxes. 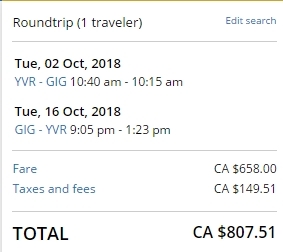 And some from Victoria for $753 CAD roundtrip. Update 2/12 - United Airlines is now showing flights from Vancouver to Rio de Janeiro and Sao Paulo, Brazil for $760 CAD roundtrip including taxes. ^^^ various dates in late February, March, and April. vancouver, yvr, flight deals, delta, south america, united airlines, brazil, sao paulo, sao, gig, rio de janeiro and gru.